Researchers all around the world are investigating possible concepts and technologies for the fifth generation of mobile networks (5G). Many use cases have been summarized in various white papers and reveal challenging requirements. The possible technologies and concepts under discussion to meet these requirements are quite diverse. Beyond doubt there is a need to improve the understanding of potential new air interfaces at frequencies above current cellular network technologies, from 6 GHz right up to 100 GHz, as well as advanced antenna technologies such as massive MIMO and beam forming. One of the technology components discussed in 5G to address high capacity and high user data requirements is the adoption of significantly higher bandwidth modes. Obviously this will only be possible at significantly higher carrier frequencies compared with today’s cellular network implementations below 6 GHz. Since concrete system specifications are not yet available, the bandwidth requirements discussed range from 500 MHz to 2 Ghz. Various research projects are already evaluating potential spectrum above 6 GHz, however concrete spectrum agreements by the ITU are not foreseen anytime soon. For the cellular industry, spectrum above 6 GHz is a new area and there is a need to understand the new ideas and concepts under discussion. Consequently, researchers require flexible test and measurement solutions to generate and analyze wideband signals with carrier frequencies ranging from 6 GHz to more than 60 GHz. 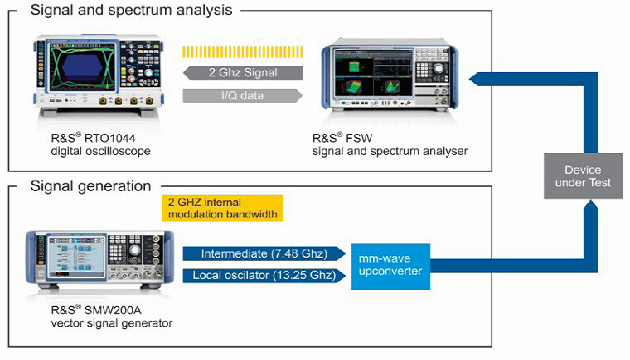 The R&S FSW signal and spectrum analyzer provides unmatched measurement capabilities up to 85 GHz without the need for external down conversion components. Above 85 GHZ, a family of harmonic mixers (R&S Z90/ R&S Z110) is available to reach absolute frequencies as high as 110 Ghz. The R&S FSW features built-in demodulation up to 500 MHz bandwidth, which can be extended to enable 2 GHz signal analysis with an external Rohde & Schwarz oscilloscope. Additional software options complement the flexible solution. The R&S FSW-K70 option flexibly analyzes digitally modulated single carriers down to the bit level, the R&S FS-K96 OFDM analysis software enables modulation measurements on general OFDM signals and the R&S FSK196 option provides analysis capabilities for the 5G air interface candidates, including GFDM, UFMC and f-OFDM. The R&S SMW200A is the first vector signal generator to offer an internal modulation bandwidth of 2 GHz with a frequency range of up to 40 GHz that enables R&D engineers to generate signals with extreme wide bandwidth up to microwave frequencies. Equipped with R&S SMW-K114 5G air interface candidates option, the R&S SMW200A can be used to create potential 5G candidate waveforms such as FBMC, UFMC, GFDM or f-OFDM, allowing the user to understand and analyze design challenges. Example of a 5G test setup supporting high bandwidths and wide frequency spectrums. 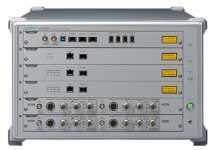 This test solution is equally applicable for IEEE 802.11ad (60 GHz WiGig) testing. The internal ARB functionality supports playback of e.g. Matlab waveforms with a bandwidth of up to 2Ghz. – The R&S SMW200A configured as a two-path instrument offers 20 GHz maximum frequency at each RF output. This configuration is ideal for providing and controlling both LO and IF to an external up converter with a single instrument. Signal generation for frequencies higher than 40 GHz can easily be realized. – Typical test scenarios such as coexistence tests with LTE or wide bandwidth 5G signal generation in the microwave range are now possible with one single unit. 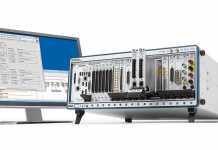 How Rohde & Schwarz test and measurement solutions can be used to generate and analyze 5G waveform candidates. Orthogonal frequency division multiplexing (OFDM) is the access scheme that is used in today’s LTE/LTE-Advanced networks. Two separate waveforms are utilized to gain access to the network: OFDM access (OFDMA) in the downlink and single carrier frequency division multiple access (SC-FDMA) in the uplink. Both waveforms benefit from OFDM being a multicarrier transmission technique, but also share its disadvantages such as high sensitivity to frequency and clock offsets, a high peak-to-average power ratio (PAPR) and less spectrum agility. The sensitivity to frequency and clock offsets makes it necessary to periodically embed synchronization signals and reference signals into the overall signal and requires the device and network to synchronize before communications (exchange of data) can take place. The limited spectrum agility in LTE depends on the transition between consecutive OFDM symbols. The discontinuity (phase transition) between two OFDM symbols during signal generation causes spectral spikes in the frequency domain. This results in high out-of-band emissions and therefore a guard band is typically defined to prevent interference between neighboring channels. OFDM-based signals such as LTE also use a long symbol duration plus a cyclic prefix to avoid inter symbol interference (ISI) due to the expected delay spread of the radio channel. Generalized frequency division multiplex (GFDM) – Filter bank multicarrier (FBMC) – Universal filtered multicarrier (UFMC) – Filtered OFDM (f-OFDM). The performance of these Waveform candidates is currently being analyzed and evaluated. At the same time new multiple access schemes are also being researched, including sparse code multiple access (SCMA), non orthogonal multiple access (NOMA) and resource spread multiple access (RSMA). However, at this point it has not been decided if any of these waveform candidates or multiple access schemes will be utilized in a future 5G system. It is up to the standardization committees to submit their proposal to the IMT2020 group within the International Telecommunication Union (ITU). They will decide if the proposal is accepted as a technology for a 5G mobile communications system that can use the frequency bands identified by the ITU at the World Radio Conferences (WRC). The R&S SMW200A vector signal generator from Rohde & Schwarz is ideal for generating 5G candidate waveforms such as GFDM, FBMC, UFMC and f-OFDM. The flexible graphical user interface (GUI) allows simple and easy changing of waveform parameterization, selection of different pulse shaping filters, filter length and stop band attenuation, and features windowing functionality. Different modulation schemes can be applied. PN sequences can be used to execute hardware-in-the-loop experiments i.e. for component testing (e.g. filter, power amplifier) and verification of 5G mm Wave reference. The R&S FS-K1965G air interface candidate’s option is an OFDM analysis software that provides the required functionality to analyze e.g. GFDM or UFMC-based waveforms. The software offers error vector magnitude (EVM) measurements per subcarrier and symbol, constellation diagram, group delay measurement and much more. The R&S FS-K196 is the right tool for measuring the signal quality of the newly defined 5G waveforms to investigate their performance capabilities. The R&S NRPM OTA power measurement solution is the first solution for measuring transmit power over the air interface for 5G and wireless gigabit components. The solution enables users working in development and production to calibrate the output power of the antenna on a DUT and to test the DUT’s beamforming function. Base stations, access points, wireless devices and radio modules use phased array antennas to transmit 5G and wireless gigabit radio signals. Beamforming is used to control the direction of radiation of the transmit antenna in order to maximize the power level at the receiver. 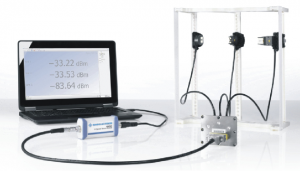 The R&S NRPM OTA power measurement solution from Rohde & Schwarz now allows users to measure and calibrate the output power of a DUT as well as test its beamforming function – all with a single, simple test setup. 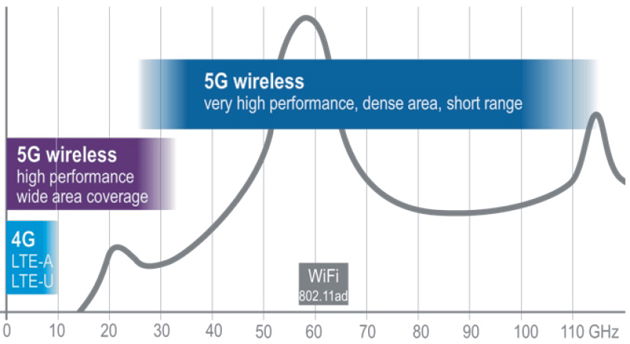 The solution works in the frequency range from 27.5 GHz to 75 GHz and therefore covers the 28 GHz band currently being discussed for 5G as well as the frequency range from 55 GHz to 66 GHz for WLAN in line with IEEE 802.11ad and frequencies above 66 GHz in line with IEEE 802.11ay. The R&S NRPM OTA power measurement solution consists of two core components: the antenna module and the three-channel sensor module. The R&S NRPMA66 antenna module is a simple, polarized vivaldi antenna with an integrated diode detector for power measurements. Thanks to its high linearity, it measures the relative power with measurement accuracy better than 0.2 dB. Because the power is measured directly on the antenna, the user does not need any additional RF cables, which also eliminates complex compensation for cable loss. 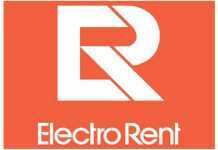 With a single antenna module, the user can calibrate the output power on a DUT, for example. With several spatially offset antenna modules, it is possible to test a DUT’s beamforming function. The R&S NRPM3 three-channel sensor module processes measurements from up to three antenna modules. If more than three antennas are needed for a test setup, users can operate any number of sensor modules in parallel. The additional measurement points increase the measurement resolution during beam forming tests. The free R&S power viewer plus PC software from Rohde & Schwarz is available for evaluating and processing the measurement data. It can be used to visually monitor measurements on up to twelve channels and, for example, to determine the average power. For measurements in its R&STS7124 19″ shield chamber, Rohde & Schwarz also offers the R&S NRPM-ZD3 cable feed through with integrated feed through filter. This allows users to acquire signals in a shielded measurement environment for measurement results that are always reproducible.